Mark 2 Podium Steps Hire. UK Delivery. £32 Per Week. With the Mk II in action you can achieve a working platform height of 1.5m in complete safety and you will find that working at exactly the right height for the job will mean you can save valuable time and energy. 1.5m platform height. 3.5m working height. Imagine the perfect solution for those low-level jobs which does not involve using a step ladder or a mobile scaffold tower. The podium steps Mk II could be exactly what you have been searching for. The Mk II is ideal for small jobs both indoors and out where using alternative equipment is simply not appropriate. 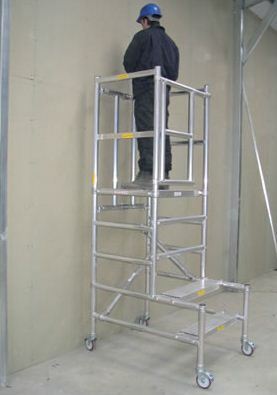 Perhaps you just have one small job to do and assembling a mobile scaffold tower is not time-effective or you need to work alone for part of the time, impossible if you are using a ladder. Manufactured from aluminium, the Mk II is lightweight at just 29kg and can simply be folded flat so it is easy to manoeuvre on site, through single door frames and transport. The Mk II podium steps are made to the very highest specification which conforms with all the current HSE and building regulations. If you have any questions please call and speak to our PASMA trained staff for the best solution for your project. It has four different platform heights on a safe anti-slip platform, giving you access to a 360 degree work area which allows you to stretch to the limit with total security. Extra safety features include a deeper back section of added stability, a guard rail of 1m above the platform at all heights and easy access with steps with have locking hooks. The Mk II even has an easy-to-operate gate with a locking hook for extra safety and a swivel locking castor. No job is too small when it comes to safety and peace of mind. The podium steps can be assembled in literally seconds and continually moved allowing you to get your job finished faster.